Title: MUNDI LAPIS LYDIUS sive VANITAS per VERITATEM FALSI accusata & convicta Opera D. Antonii a Burgundia Archi-diaconi Brugensis. Description: Antwerp, Viduae Joan. 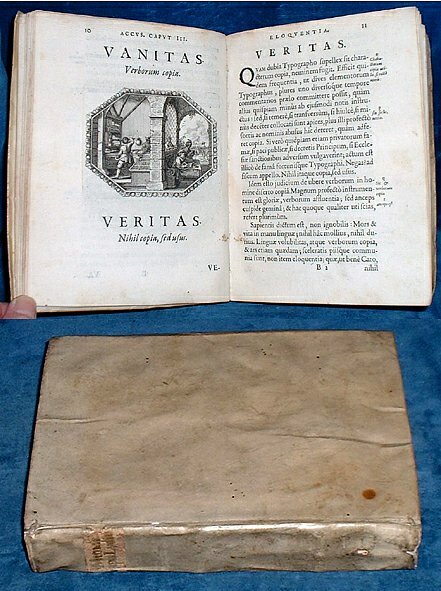 Cnobbari 1st edition 1639 Copperplates (46 of 50 the missing 4 tipped in in facsimile on matching paper) by A. Pawels +Engraved titlepage by T.J. van Merlen after A. van Diepenbeeck. . Quarto vellum [xxvi]+249pp (of which 4 leaves are in facsimile on matching paper) +pp with errata list at end of the index. Damp tide marks to first 15 leaves which do not affect paper quality which is strong, supple & crisp. No tears, minimal signs of use or foxing affecting less than a dozen leaves. Bookplate Charles Clement Roemers at Maestricht on pastedown and traces of another removed, 17th century inscriptions on flyleaf & *2 otherwise no marks to text or plates. Lacks rear free endpaper. Good margins, thick paper and strong impression of both text and copperplates (Praz 292 Landw.72).